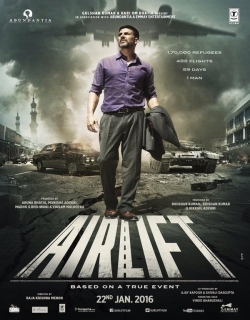 Airlift is a 2016 Indian Bollywood action film released on Jan 22, 2016. 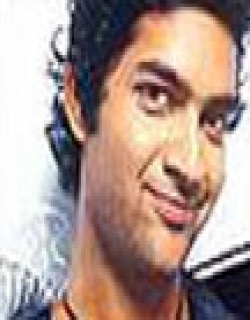 The film is directed by Raja Krishna Menon, produced by Aruna Bhatia under banner named T-Series Super Cassettes Industries Ltd..
Ranjit Katyal (Akshay Kumar), an Indian businessman, rich and powerful who always considers himself as Kuwaiti rather seen an Indian. He realizes he no longer holds any influence on the Iraqis, and that he and his family as much danger as any other. 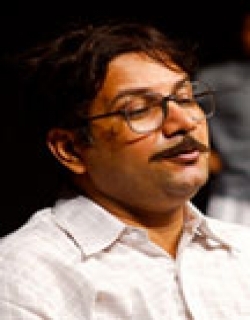 Ranjit accidentally becomes man who suppose to help 1,70,000 Indians living in Kuwait. This is a story of Indians stuck in Kuwait during war time. This is story about how Ranjit helps 1,70,000 Indians to survive the Iraqi invasion, and against all odds traveled a thousand kilometers across the border into Amman, Jordan. From Amman, 1,70,000 Indians were brought back from Ammam by the largest and the most successful evacuation ever attempted in the history of the world. Indian government systematically flew over 488 Air India commercial flights into a war zone to evacuate all 1,70,000 Indians in 59 days and safely bring them back. 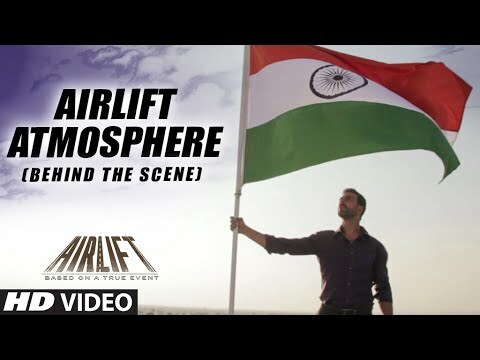 Check out this page for more updates on Airlift. AIRLIFT - "Chot Lagti Hai Na To Aadami Maa Maa Hi Chillata Hai"
Airlift is the story of unparalleled courage and unsung heroes. From unknown names in the Ministry of External Affairs in Delhi to people who had their Indianness rearing its head..
…is a classic film based on a real life incident that is told extremely well on screen. It is surely one of the best films to come out this year and will pick up with a stro..
For my money and time, Akshay Kumar is the most watchable star in Bollywood today. See Airlift. You will know why. Unlike the other superstars his growth is constant. Every .. It is patriotic, heroic and what not. Do not even think about giving this a miss, you may end loosing a good two something hours of your life. The first half of the film moves smoothly but the hasty evacuation towards the end makes the story lose grip.This was a story waiting to be told, and it has been. Airlift is a film that every Indian, and every Bollywood buff despairing for genuinely high quality storytelling, must watch. 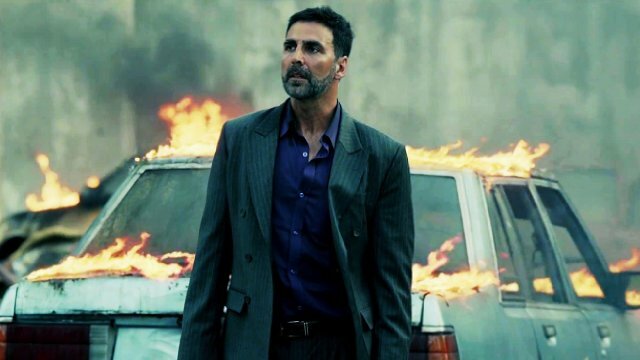 This page provides latest and updated information about Airlift (2016) movie which released on Jan 22, 2016. 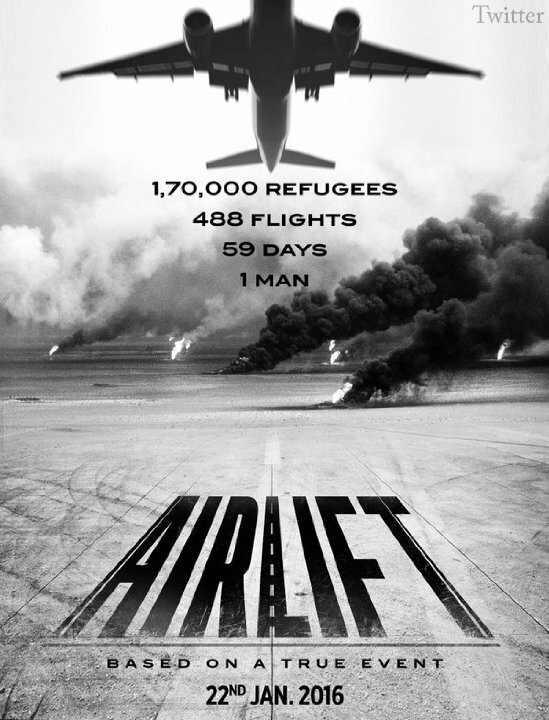 Airlift (2016) is directed by , produced by , starring .We have also provided 12 trailers and videos, 10 photos, 1 user reviews, and 31 critic reviews.Airlift (2016) has received 3 rating from user reviews.The movie has received 3.6 rating from critic reviews. 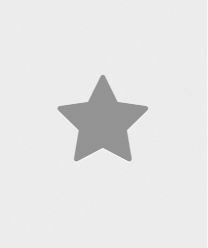 The overall rating of Airlift (2016) is 68 and movie is 3.4.You can review, like, dislike this movie and also can add to favorites. You can also find information on showtimes, CDs, DVDs, online rental, online free watching.